Using the superior sensitivity of ESA's X-ray observatory, XMM-Newton, a team of European astronomers has made the first direct measurement of a neutron star's magnetic field. The results provide deep insights into the extreme physics of neutron stars and reveal a new mystery yet to be solved about the end of this star's life. A neutron star is very dense celestial object that usually has something like the mass of our Sun packed into a tiny sphere only 20-30 km across. It is the product of a stellar explosion, known as a supernova, in which most of the star is blasted into space, but its collapsed heart remains in the form of a super-dense, hot ball of neutrons that spins at a incredible rate. Despite being a familiar class of object, individual neutron stars themselves remain mysterious. Neutron stars are extremely hot when they are born, but cool down very rapidly. Therefore, only few of them emit highly energetic radiation, such as X-rays. This is why they are traditionally studied via their radio emissions, which are less energetic than X-rays and which usually appear to pulse on and off. Therefore, the few neutron stars which are hot enough to emit X-rays can be seen by X-ray telescopes, such as ESA's XMM-Newton. One such neutron star is 1E1207.4-5209. Using the longest ever XMM-Newton observation of a galactic source (72 hours), Professor Giovanni Bignami of the Centre d'Etude Spatiale des Rayonnements (CESR) and his team have directly measured the strength of its magnetic field. This makes it the first ever isolated neutron star where this could be achieved. All previous values of neutron star magnetic fields could only be estimated indirectly. This is done by theoretical assumptions based on models that describe the gravitational collapse of massive stars, like those which lead to the formation of neutron stars. A second indirect method is to estimate the magnetic field by studying how the neutron star's rotation slows down, using radio astronomy data. In the case of 1E1207.4-5209, this direct measurement using XMM-Newton reveals that the neutron star's magnetic field is 30 times weaker than predictions based on the indirect methods. How can this be explained? Astronomers can measure the rate at which individual neutron stars decelerate. They have always assumed that 'friction' between its magnetic field and its surroundings was the cause. In this case, the only conclusion is that something else is pulling on the neutron star, but what? We can speculate that it may be a small disc of supernova debris surrounding the neutron star, creating an additional drag factor. The result raises the question of whether 1E1207.4-5209 is unique among neutron stars, or it is the first of its kind. 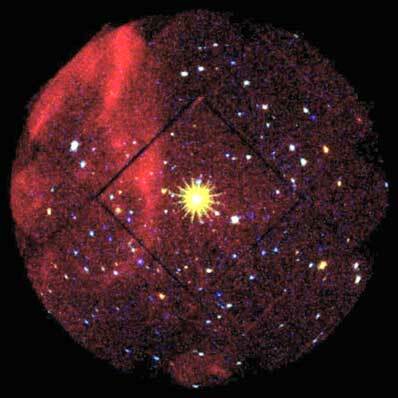 The astronomers hope to target other neutron stars with XMM-Newton to find out. X-rays emitted by a neutron star like 1E1207.4-5209, have to pass through the neutron star's magnetic field before escaping into space. En route, particles in the star's magnetic field can steal some of the outgoing X-rays, imparting on their spectrum tell-tale marks, known as 'cyclotron resonance absorption lines'. It is this fingerprint that allowed Prof. Bignami and his team to measure the strength of the neutron star's magnetic field. These results are being published in this week's issue of Nature.